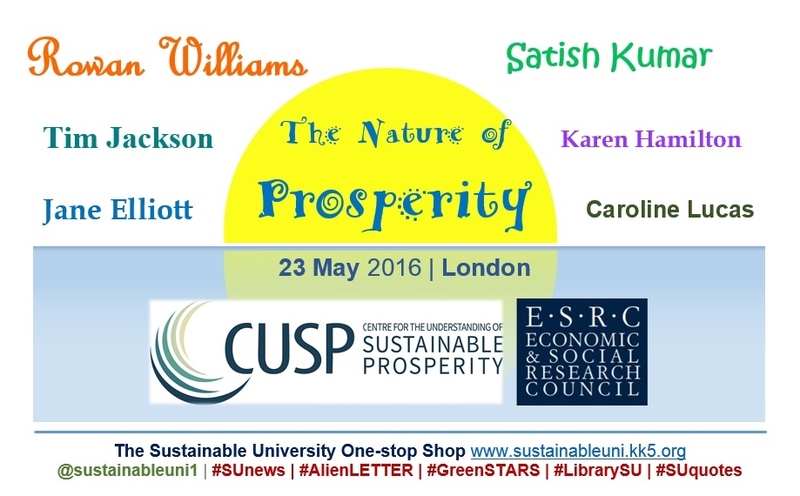 An event, titled ‘The Nature of Prosperity,’ will take place in London (Central Hall Westminster, Storey’s Gate, London, SW1H 9NH) on 23 May 2016 from 14:30 to 18:30. Hosted by the Centre for the Understanding of Sustainable Prosperity (CUSP), this event is the first in a series of public debates on the nature of prosperity. It will bring together academia, business, policy and civil society in exploration of one of the most vital questions today: What does prosperity mean in a world of environmental and social limits? The event also marks the launch of CUSP, a project funded by the Economic and Social Research Council (ESRC). The event features Dr Rowan Williams (the former Archbishop of Canterbury) in conversation with long-time peace and environmental activist Satish Kumar. Other speakers include: Jane Elliott (Chief Executive of the ESRC), Karen Hamilton (Global Vice President Sustainable Business, Unilever), Tim Jackson (Director of CUSP) and Caroline Lucas (MP and Chair of the All Party Parliamentary Group on Limits to Growth). CUSP, a multi-disciplinary centre led by the University of Surrey, has an overall aim of exploring the economic, ecological, social and governance dimensions of sustainable prosperity and of making concrete recommendations to government, business and civil society in pursuit of it. Its guiding vision for sustainable prosperity is one in which people everywhere have the capability to flourish as human beings – within the ecological and resource constraints of a finite planet. Notes: (1) This post is based on the news post on the CUSP website. (2) Logos in the graphic are also from CUSP and ESRC websites.